Merida. . Wallpaper and background images in the डिज़्नी प्रिन्सेस club. This डिज़्नी प्रिन्सेस photo might contain kirtle, कीर्टल, एक प्रकार का नाच, and पोलोनीज़. They hardly changed her. look at her concept art. Do we really need to keep arguing about this? other people have posted good pics countering this, too. 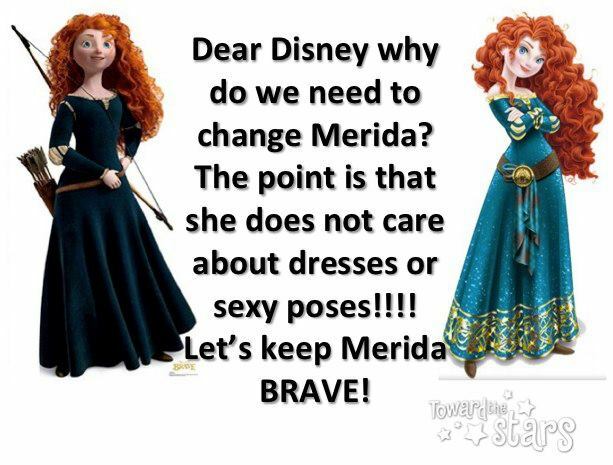 Yeah, I love Merida's 2D look. And still say ha to the faces of the petitioners. If Fanpop had a Like button like YouTube and Facebook, I would like LupinPrincess's "Omg shut up". I prefer the right picture.